I’ve made a career change! I have been a consumer of “enabling technology” my entire career. I am now stepping behind that line as I want to be able to influence and shape the technology that enables designers and developers to deliver the best imaginable experience. I have joined the product management team for Flash runtimes at Adobe, which allows me maintain my focus on the best imaginable, and uncompromising, experience for the user. Flash has enabled this mission more than any other technology on the web and has allowed me to build some tremendous experiences. When user experience was considered a unique differentiator, the Flash/Flex partnership was there to enable. The landscape has evolved. Thankfully user experience is no longer a differentiator, it’s an essential. To succeed we must put the user first. The tech community has responded admirably and the expressiveness associated with Flash is moving in to the open-standards that are being defined by HTML5, which will enable a new wave of uncompromising experiences across the web. Adobe gave meaning to expressiveness and continues to innovate through contributes to HTML5 standards, such as CSS regions and CSS shaders. I am sure there is even more goodness to come as we will undoubtedly see more innovation through ongoing contributions to standards and our active participation in open-source projects such as Webkit. So what’s next for Flash? As outlined in the recent roadmap for Flash runtimes we will be focusing on gaming and premium video. This week Adobe launched a new site specifically around gaming. There are already some tremendous games that showcase the unique capabilities of Flash, which are built on Stage3D to leverage the hardware acceleration afforded by the GPU. The AIR 3.2 release candidate brings the power of Stage3D to mobile in conjunction with the Flash Player 11.2 release candidate. Already some of the top games on the Apple App Store, such as Machinarium, have been brought to you by Flash and Adobe AIR. The Flash runtimes are alive and kicking on iOS! I also care a lot about the experience of the designer and developer and making our technology accessible. I want to make the experience of using our technology a good one. I want to make it easy to design-develop-deliver incredible experiences. In this post I want to demonstrate an AIR client, that makes a remote call to a Node.js app running on Heroku, and receives a real-time update from Pusher. Over the last 6 years I’ve built a number of enterprise RIAs using Flex/AIR and LiveCycle Data Services. I’m not alone in this, there are big investments out there in the Adobe technology stack and some incredible apps. While the HTML5 family offers comparable capabilities it’s not easy to turn your back on an investment. It takes time to pivot. I’ve been thinking about how we can combine these technology stacks as they aren’t mutually exclusive. One strategy I’ve been looking at is using Node.js on the server-side. 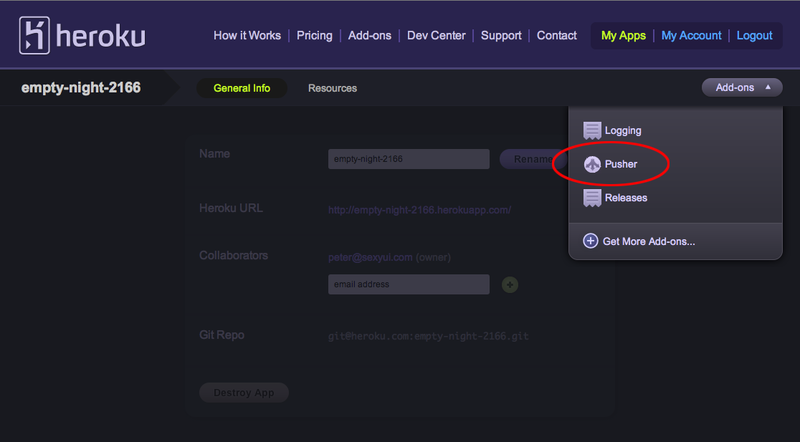 If I’m using Node.js then I am using Heroku. On the client-side I used AIR. Before we jump in to the nuts-and-bolts I’ll make my disclaimer, this isn’t meant to showcase clean code or a clean user experience, it’s a spike to prove it all works. So pulling it all together. 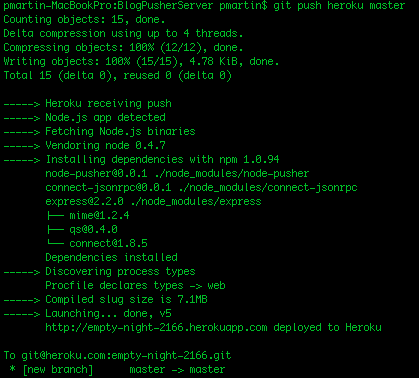 The Node.js app is deployed to Heroku and uses the Pusher add-on to send realtime messages. 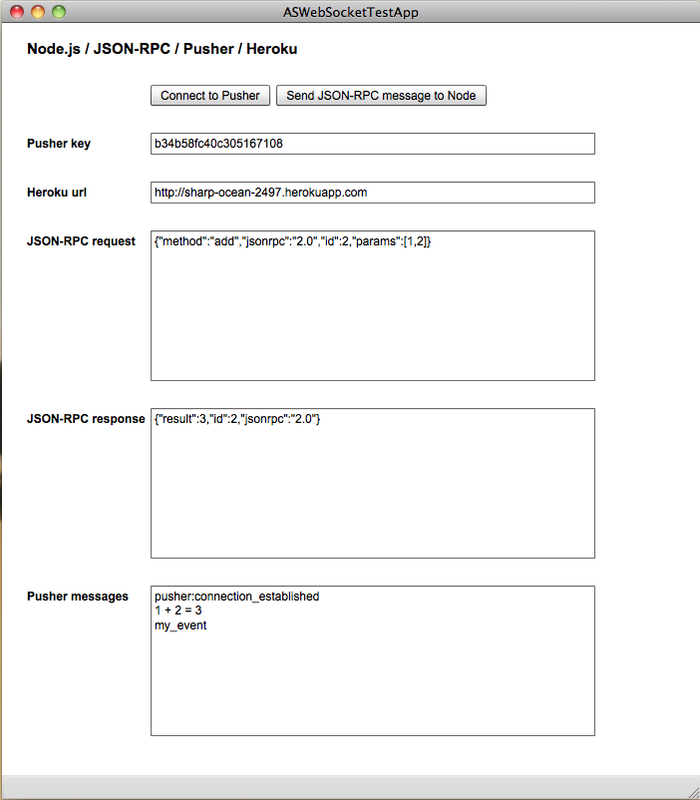 The AIR client connects to Pusher and makes a JSON-RPC call to the Node.js app. The AIR client receives a response back from Node.js and a message from Pusher. git commit -a -m "updating pusher details"
The code is raw, but it should be simple enough to follow. In the client code (PusherClient.mxml) the key functions are connect() and sendMessage(). The sendMessage() function is a little more involved. We start by constructing our JSON-RPC request. I am using the native JSON support added in FlashPlayer 11. So I create an Object that represents my request and then call JSON.stringify(), which takes the Object and returns it in JSON format. The final part is to send the request to the server, which is just a case of ensuring our HTTP request is set up correctly. It’s not rocket science and the code could be easily refactored to separate out the different responsibilities and to create a clean API that abstracts the developer from the detail. I used a few packages, namely the node-jsonrpc package from Eric Florenzano, and node-pusher from Jaewoong Kim. In addition to these packages being referenced in the code (web.js), they are also specified to Heroku in package.json. If you look at their respective examples you will see I have simply combined them in to my spike. Although Heroku dynamically assigns the port number, you still connect using port 80 (I got caught out by that one). Other than getting tripped up by the port, which I mentioned above, I didn’t run in to any specific issues. It just worked.